Brujo was the inspiration for Tevildo in Out of the Blue and The Last Hero. He will be missed. Thank you. I had hoped to have him for a few more years, but it wasn't to be. I'm so sorry. He's so handsome; I can see he was a character just from the way he's looking at the camera. They come and go, like the rest of us, but it's always hard when they do go. And I'm sorry we haven't spoken in so long too! Every now and again I look up and another few months have passed and I can only wonder where the time went. (Footnotes and Latin, mostly, at least at my end.) I hope your family's all well and everything's going well for you and Buns. He was a big, sweet teddy-bear of a cat. It was hard to see him fade. I am so sorry to hear this. You've had a really tough last six months or so and this is one thing you really didn't need :-( Sending *hugs* and white light your way. You are often in my thoughts and prayers and you know that I'm always available to talk or message. Tough six months -- tough year. Brujo is the sixth cat we've lost since last May. I really hope the bad times are over. Thank you for the hugs. Oh my, I wasn't aware of that! I hope that as we enter Spring (finally) that this winter of the past year will finally leave you and things will seriously improve. I'll keep you in my prayers, of course. Aw, poor Brujo. He was beautiful in body and spirit. He will be missed. As Buns said this morning, he was a good cat who never caused us any trouble. Unlike the story, where the kitten was rescued from a tall tree, Brujo came to us in the dead of January, cold and starving in our hay barn. Buns was the one who brought him the turkey roaster with the last vestiges of the holiday turkey in it. Brujo jumped in (he was a lot smaller then) and from then on, Buns was his beloved person. We're both taking it hard. Do I ever know that feeling! I hate that feeling. I really hate it. I'm so very sorry. Having recently lost a cat who had been with me through a number of significant shifts in my life and whose decline was swift but no less painful, I am truly very sorry for your loss. It's hard losing a cat, whenever it happens. With Brujo, there was the extra factor of it coming too soon. By all rights, he should have had another third of his life left to live. Of course, cancer strikes whenever it wants. Nothing one can do. I'm sorry about your cat too. I am so sorry. He looks gorgeous. He was. He was magnificent. What a beautiful cat. 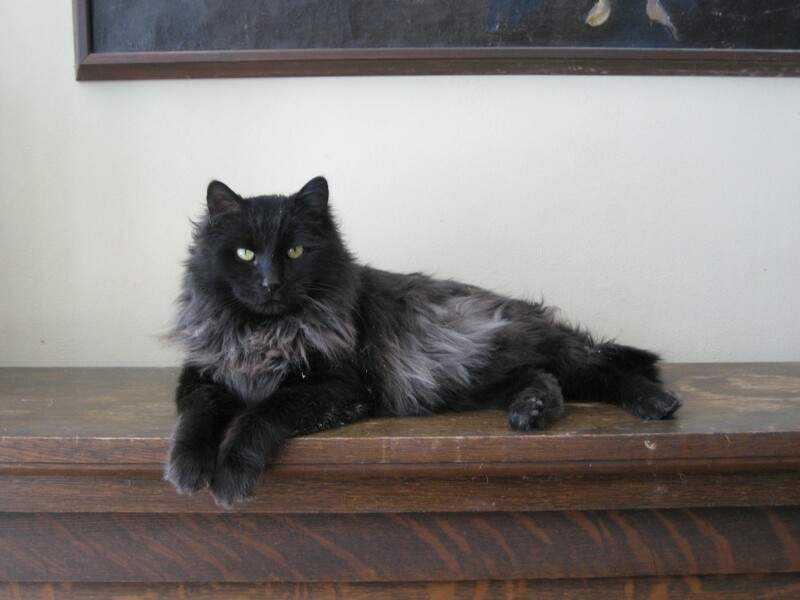 His coloring is striking, and in that picture, he exudes a calm dignity. Very sorry for your loss.